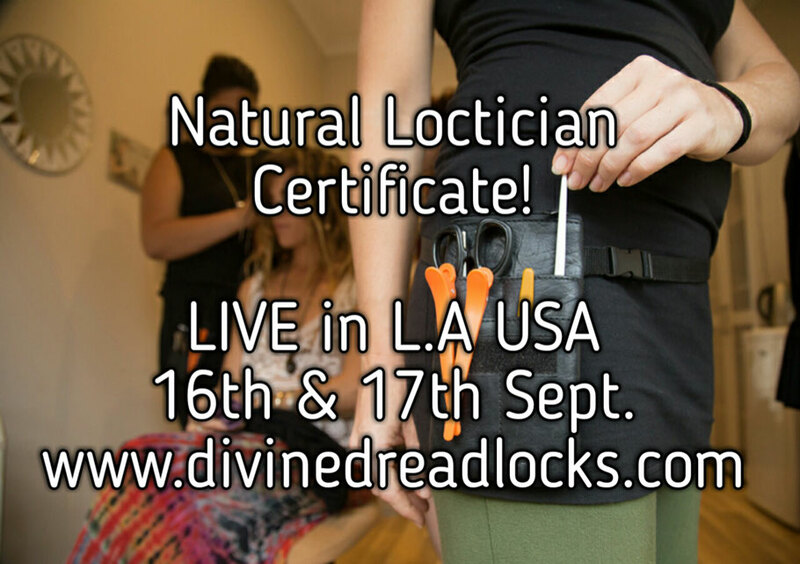 ENROL BEFORE 24TH SEPT AND GET 50% OFF THE NATURAL LOCTICIAN CERTIFICATE COURSE ONLINE/LIVE COMBO COURSE IN LOS ANGELES !! ENROL IN THE NATURAL LOCTICIAN CERTIFICATE ONLINE + LIVE WORKSHOP combo! LOS ANGELES: 16 & 17 sept.
ENROL BEFORE THE 24TH OF AUGUST TO GET A HUGE 50% OFF THE SET PRICE! 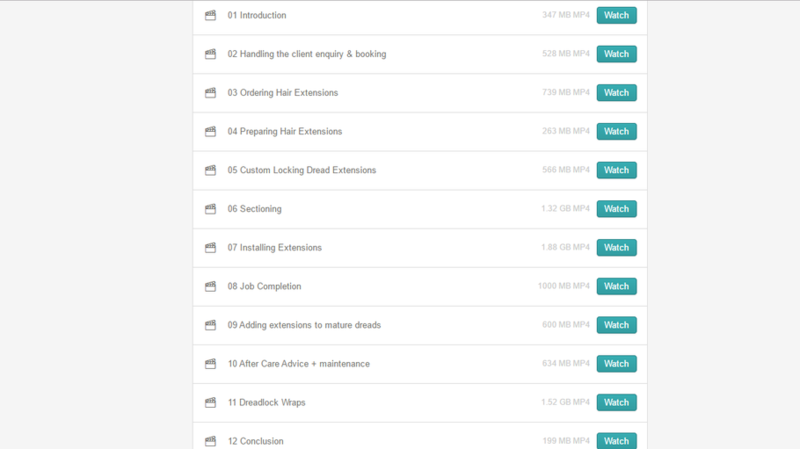 This is the highest quality dread Loctician Training at the cheapest price. Would you like to become a Natural Dread Loctician and run your own lifestyle business? Would you like to make instant, well formed, stunning, tight locs for people? And provide a maintenance service that lasts? Would you like to care for the environment by providing a dread service that doesn't require any products? Would you love to offer a seamless high quality dreadlock extensions service? 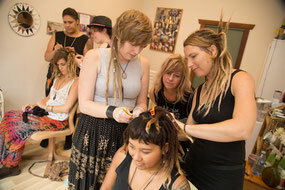 Would you like to learn how to make dreadlocks on ALL hair types? Would you love to have a skill that allows you to work creatively, meet amazing people & earn good money? Would you love to create your own working days and hours and take holidays when you want? Or would you love a way to earn extra cash on the side of your mainstream job? And would you like to travel with your new skill? EITHER LEVELS 1 OR 2 WITH DIVINE DREADLOCKS. EM YOUR TRAINER HAS 17 YEARS EXPERIENCE AS A NATURAL DREAD LOCTICIAN LOCKING OVER 2000 CLIENTS OF ALL NATIONALITIES AND HAIR TYPES WITH ONLY 5 STAR REVIEWS!! SHE IS ALSO A PROFESSIONALLY TRAINED TEACHER WITH A BA.VISUAL ARTS & DIPLOMA OF EDUCATION WITH 9 YEARS TEACHING EXPERIENCE, WHICH MAKES HER COURSES VERY EASY TO LEARN FROM! SHE INNOVATED THE THAI CROCHET METHOD, AFTER HAVING HER FIRST DREADLOCKS MADE IN THAILAND IN 2000 WITH HER OWN STYLE TO CREATE THE NEATEST, INSTANT, WELL FORMED LOCS WITH BARELY ANY LOSS OF LENGTH, A HIGH LEVEL OF CUSTOMER SERVICE AND NO BREAKAGE OR WEAKNESS! Produces locs that are low maintenance. Produces locs that don't need palm rolling or twisting. Doesn't use any loc products to make or maintain dreads. Doesn't loose much length (*except when the hair really thins out at the end). Allows for closed, tapered or open flowing tips that don't come open. Creates locs that are sectioned well & sit nicely from day 1. And makes for very happy repeat clients! SO HOW CAN YOU STUDY THE NATURAL LOCTICIAN CERTIFICATE COURSES? YOu can choose to study online from anywhere in the world or come to our live practical courses in studio in Byron Bay Australia. But now for the 1st time you can do a online/live combo course in Los Angeles, USA! Students will benefit greatly from the unique mix of independent learning (at their own pace online) and getting live face to face tuition after their online studies, to fine tune their skills in person, get assessed and certified and have all their questions answered. enjoy more freedom and meet amazing people! any rolling, chemicals, products & minimal maintenance. Save yourself from learning bad habits from young people making dreads on friends for YouTube videos and learn all the secrets to running a high quality dreadlock service from a professional Loctician and Teacher! Discounts on L.A combo courses are available for, couples/friends & hairdresser groups after promotional half price period up until enrollment cut off on the 31st August. Divine Dreadlocks history and your trainer's background to know you're getting top quality tuition. Learn about the 3 other mainstream dreadlock methods and their results. How DH&H method produces instant, natural dreads, that don't need palm rolling to lock. How to make dreadlocks without ever having to use a product. Super earth friendly! The benefits of deep connection: diverse conversation skills & how to gain repeat clients. How to set up your dreadlocking studio so it's professional and comfortable. How to give high end client service, that rapidly increases your clientele. How to section hair for making sustainable dreads of all sizes thin to thick. How to create the correct sized base for sustainable instant dreadlocks depending on the hair type. How to create instant locs in all hair types: afro, caucasian hair, asian and every mix possible. How to professionally assist clients with all dreadlock decisions. How to give natural after care advice. How to professionally quote clients with precision (time and price). Learn the current market price for creation and dreadlock maintenance. Learn the wage increases possible as your experience grows. 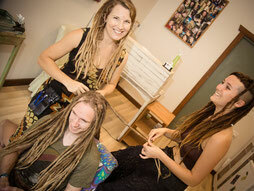 Learn the ethos' behind running an earth friendly dread business with high standards! who is the natural loctician certificate 1 perfect for? People who appreciate dreads & want a creative, lucrative at home business. Anyone wishing to escape the rat race. WHAT WILL I LEARN IN THE NATURAL LOCTICIAN CERTIFICATE LEVEL 2 EXTENSIONS & WRAPS COURSE? You'll learn how to add a complete dreadlock extensions service to your dread business OR simply learn everything you need to create, install and maintain dreadlock extensions for yourself, friends or family. 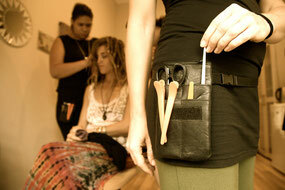 You will also learn how to make a full dreadlock wrap and a "criss cross" dreadlock wrap. You'll learn how to apply every skill to a high quality including the customer service end. The course specialises in using 100% natural human hair but all aspects can be applied if you wish to use a mixture of synthetic and human hair or 100% synthetic. There are no Theory PDF's in this course, relevant theory is taught in the videos. There's no assessment, but to get your Level 1 Certificate upgraded to "Advanced Loctician" you can email your trainer for details. Please read the ENTIRE CONTENTS of the LEVEL 2 COURSE BELOW. WHO IS THE EXTENSIONS & WRAPS COURSE PERFECT FOR? Anyone already running a natural dreadlock service business with little or no knowledge of how to create & install dreadlock extensions or offer dread wraps. Anyone already running a dreadlock service business who may be using the backcomb/wax or twist & rip/wax or backcomb/perm solution/roll/wax method who wishes to learn how to create 100% natural human hair dreadlock extensions and offer a high quality install service. Anyone already running a dreadlock service business, currently offering dreadlock extensions, with a desire to improve their skill, technique & knowledge level in regards to all areas of the service such as: quoting & consulting, sourcing the best 100% natural human hair, knowing the best two joining methods for creating strong installs and when each is appropriate and how to offer excellent follow up care & maintenance. Anyone withOUT dreadlocking experience who wishes to start a dread service with a full skill set and combine the Level one and Level two courses immediately. Anyone who has a keen interest in how to create and maintain top quality natural dreadlock extensions for friends or family with or without view to business. Anyone who wants to add natural dreadlock extensions to their own dreadlocks or their friends. KEEP READING DOWN THE PAGE FOR HALF PRICE OFFER! Open your own little dreadlock studio in a groovy part of town or have a stall near a beach/shop. Run a fun sociable business at markets and festivals! Operate as a hobby business around your main job to earn extra cash to for travel, holidays, house! Be tutored by someone who has used these methods to create and maintain her own dreads for 10 years! Be rest assured this method will work for people of all backgrounds, because your trainer has tried and tested it on over 2000 clients with different hair types over a 17 year period! By doing Level 2 Extensions & Wraps course you'll add a very popular service to your dreadlock business. Increase your income as a Loctician. People pay from $800 to $2000 for good dreadlock extensions. Learn where to source the best 100% natural, ethically sourced human hair. You can apply the techniques to creating synthetic extensions also. Learn the top two methods of installing dread extensions for a seamless and strong join. Learn how to create balayage dread extensions. Learn how to offer important dread extension care advice. Learn to offer a high quality extensions maintenance service. CONTINUALLY GAIN FROM A HIGH LEVEL OF SUPPORT FROM THE DIVINE DREADLOCKS TRIBE! Be supported by your trainer & students/graduates of the course in the private facebook group. Get a free listing for your new business on our worldwide dread loctician directory. Get future access to a direct client referral service (you get handed clients) for a low monthly fee. Get 2 free phone or Skype advice sessions from Emma. Gain a certificate recognised by dreadlock lovers worldwide. what do past students think of the ONLINE AND LIVE CERTIFICATE courseS? ENROL IN THE NATURAL LOCTICIAN CERTIFICATE ONLINE COURSEs + live workshop HERE! use code for 50% off! Become a Natural Loctician & Run your own lifestyle business!